The World Doesn't Require You announces the arrival of a generational talent. In creating his very own Yoknapatawpha County with the fictional Cross River, Maryland, Rion Amilcar Scott shatters rigid genre lines to explore larger themes of religion, violence, and love--all told with sly humor and a dash of magical realism. Established by the leaders of the country's only successful slave revolt in the mid-nineteenth century, Cross River still evokes the fierce rhythms of its founding. In lyrical prose and singular dialect, a saga beats forward that echoes the fables carried down for generations--like the screecher birds who swoop down for their periodic sacrifice, and the water women who lure men to wet deaths. Among its residents--wildly spanning decades, perspectives, and species--are David Sherman, a struggling musician who just happens to be God's last son; Tyrone, a ruthless Ph.D. candidate whose dissertation about a childhood game ignites mayhem in the neighboring, once-segregated town of Port Yooga; and Jim, an all-too-obedient robot who serves his Master. As the book builds to its finish with Special Topics in Loneliness Studies, a fully realized novella, two unhinged professors grapple with hugely different ambitions, and the reader comes to appreciate the intricacy of the world Scott has created--one where fantasy and reality are eternally at war. 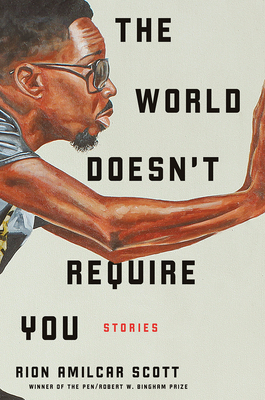 Contemporary and essential, The World Doesn't Require You is a "leap into a blazing new level of brilliance" (Lauren Groff) that affirms Rion Amilcar Scott as a writer whose storytelling gifts the world very much requires.